Many thanks to Britt Bunyard, Publisher of FUNGI Magazine, for this beautiful tribute. The mycological community was heartbroken on March 16, 2018 to learn of Gary Lincoff’s passing. He was the greatest mycologist of my lifetime, a great friend, and a great person. Gary was an American treasure. He was larger than life. Mycophiles and fans, upon seeing him for the first time in person, were nervous to approach—he was so famous. But he was the most welcoming, the most friendly, the most giving person I knew. That any of us knew. He gave absolutely all of his time to educating others. Every person in the mycological community in North America, and beyond, knew him. If you invoke the name “Gary,” everyone knows of whom you’re speaking. Gary was born and grew up in Pittsburgh, and enjoyed telling stories of early life there. But he was better known from New York City where he taught botany courses at the New York Botanical Garden. He and his wonderful wife Irene have lived many decades just a couple of blocks from Central Park in Manhattan. Anyone coming to The City was welcome at their home. They were avid foragers of everything (mushrooms included, of course), so lunch or dinner might include anything from seaweed to wild berry pies. Pretty much every week of the year, if Gary was in town, he would lead a foray in Central Park (or Staten Island, or other parks in the area), spring, summer, fall, and oh yes even during the winter months, where, without fail Lincoff would not only find but be able to extol the virtues of some poorly dried out or dormant mushroom while the New York Mycological Society faithful would listen in rapt attention. I was so fortunate to go on many outings with Gary in New York, as well as throughout the East, Midwest, and West Coast. He was the most sought-after guest mycologist at all forays in North America. And beyond. He doubtless gave thousands of lectures at mycological societies and conferences. He was so thoroughly knowledgeable, and such a gifted speaker, that he would have everyone’s attention from rote beginner to academic; in packed lecture halls, on the street in Telluride, or in the forest. Gary was a tireless writer. He contributed to FUNGI Magazine; he published in many popular science journals, as well as scientific papers in peer-reviewed journals. He wrote essays, book reviews, recipes. He wrote about other mycologists. He wrote about Thoreau (a lot). He wrote humorous plays (on mycological themes). He kept lists of mushrooms collected and identified at just about every foray he attended. His on-going species count from Central Park is somewhere around the 1,000-species mark. He authored (or co-authored) eight books on the topic of mycology and one book on general plant foraging: Simon and Schuster’s Guide to Mushrooms, The Eyewitness Guide to Mushrooms, The Mushroom Book (also by Eyewitness Guides), Mushroom Magik, The Complete Mushroom Hunter, The Mushrooms of Telluride, Toxic and Hallucinogenic Mushroom Poisoning: A Handbook For Physicians and Mushroom Hunters, The Joy of Foraging, and The Audubon Field Guide to Mushrooming, which is the most-sold guidebook to mushrooms for North America. And it was the very first mycological book of any kind that I owned. I purchased it when I was a kid. Gary was president of the North American Mycological Association (NAMA) from 1983 to 1988. In 1986 he received NAMA’s most prestigious “Award for Contributions to Amateur Mycology.” In 2015 the name of the award was changed to honor Lincoff. It was Tom Volk, another household name among the mycological community, who proposed that NAMA change the name of this award to “The Gary Lincoff Award for Contributions to Amateur Mycology.” In a speech to the NAMA Trustees in support of this proposal, Volk said “there would never be another person who would (or could) contribute so much to amateur mycology as Gary Lincoff.” The proposal was received enthusiastically, and the vote for the name change was unanimous. Gary was a Founder of the Telluride Mushroom Festival and has been the heart and soul of the largest mushroom festival in North America for nearly 40 years. It was Gary who convinced me to accept the Telluride Institute’s offer to become Executive Director of the Festival in 2015. Lincoff starred in Know Your Mushrooms, an acclaimed documentary film about mushrooms, the Telluride Mushroom Festival, and crazy mycophiles. Gary was a wonderful story teller and had a terrific sense of humor. I enjoyed every minute in his presence. We all did. When asked how he came to study mushrooms, he often told this one… “My grandparents were immigrant shopkeepers, watch cleaners, and, eventually, jewelers. My parents were professionals who, along with some of their brothers and sisters, were doctors. I don’t think the question ‘what do you want to do when you grow up’ was ever asked of them. Having read Henry David Thoreau’s Walden at an impressionable age, I only knew that I didn’t want to find out when I came to die that I had not lived, whatever that meant. In a way not totally unlike Thoreau’s I was drawn to the woods, to a life ‘outdoors.’ I didn’t know what interested me, partially because my undergraduate education was in philosophy. I somehow settled on MUSHROOMS, perhaps because it was thought of at the time as being of no account, a mere curiosity of nature, something that rotted everything else. My grandfather even had to say to me, when my behavior was already too far along to be corrected, ‘I like lettuce BUT I don’t study it!’ Somehow I knew I was on the right track. I had the great good fortune to come under the tutelage of Clark T. Rogerson at the New York Botanical Garden, who showed me how he practiced mycology, something my uncle, an ophthalmologist, thought had to do with fungal diseases. Thanks to such giants in the fields of natural history and mycology as Sam Ristich and Rolf Singer, I came to appreciate not just the astounding beauty of mushrooms, but their place in the world, and in scientific classification. 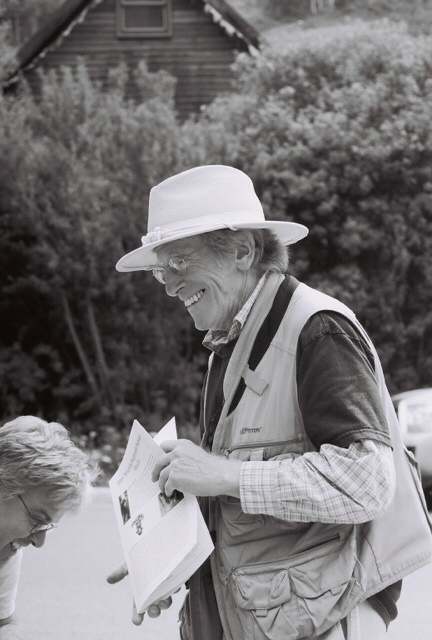 Had I not met Gordon Wasson, and soon after, Dr. Emanuel Salzman, the co-founder of the Telluride Mushroom Festival, I’d never have explored some of the places and met some of the people whose interactions with mushrooms so intrigued Gordon Wasson. Gary was interested in and knowledgeable of everything … natural history, botany, and mycology, of course. What I enjoyed most about my time with Gary was that we would talk, often for hours, and rarely about mushrooms or mycology. He knew about books and authors—he was a voracious reader—and he knew about history, politics, food (the more ethnic, the more off-the-beaten-path the better) and popular culture. Movies—old and new—television shows, opera … you name it, he devoured it all with gusto. He lived life to the absolute fullest. And he made everyone’s life much richer. And we will miss him dearly. This entry was posted in News on March 19, 2018 by paul sadowski.